It has been a year and a half since Linda Burtch of Burtch Works wrote 9 Must-Have Skills You Need to Become a Data Scientist, a post which outlined analytical, computer science, and non-technical skills required for success in data science, along with some resources for gaining and improving these skills. While this post is still relevant and quite popular, I thought I would take a shot at updating it, taking into account the direction of data science developments over the past 18 months. My approach is a bit different than Linda's, which was to distill the views of, and conversations with, a number of analytics professionals considering adapting their skills to the field of data science at the time; mine is based on observations of trends, content of articles, prevalence of ideas, and discussions with a number of individuals in various positions of career development in the field. Please take this as additional information to take under advisement, as opposed to any kind of definitive advice. Burtch provides some numbers related to the educational level of data scientists, indicating that 88% of Data Scientists have, at minimum, a Master's degree. Burtch does not explicitly provide her source, but I can only assume it comes from her firm's extensive research, with which I am not going to outright contradict. What I will offer, instead, is that data science is an incredibly diverse field, with no real consensus as to what it even is. I'm sure people will disagree with that, but when I hear the term data scientist, I tend to think of the unicorn, and all that it entails, and then remember that they don't exist, and that actual data scientists play many diverse roles in organizations, with varying levels of business, technical, interpersonal, communication, and domain skills. If we recall that different roles such as machine learning scientists, data analysts, data engineers, Hadoop administrators, and analytics-focused MBAs often get wrapped up in with the definition, it's easy to determine that there would be many paths to data science. To be fair, Burtch's definition of what a Data Scientist is, and therefore what educational levels they have, could vary quite drastically from mine. Granted, this is a single snapshot in time, and it would be foolish to draw conclusions based on this single piece of data. However, the takeaway is further evidence to support the idea that there is no one "correct" path to data science; folks come from academia, industry, computer science, statistics, physics, other hard sciences, engineering, architecture... and they hold PhDs, Master's degrees, undergraduate degrees, and, yes, some are even *gasp* self-trained (probably). Don't let anyone dissuade you from pursuing "data science," and don't let anyone tell you you have to do X to become one. Find out the data science niche you want to fill, and pursue training and education that will allow for it. And be realistic: you may aspire to Chief Scientist at DeepMind, but self-learning with MOOCs and a few textbooks likely won't do it. But that doesn't mean that self-learning with MOOCs and a few textbooks won't get you somewhere interesting in data science. If the anecdotes are to be trusted, it happens regularly. This point requires far less fleshing out. Simply put: if you don't have intellectual curiosity, data science ain't for you. Next. Whether we're talking theoretical unicorns or something closer to the data science professional periphery, you really need some understanding of the domain you are working in to be useful, analytically speaking. Consider even a purely technical role: if you are developing algorithms, pipelines, or workflows for an organization, without a solid understanding of the fundamentals of the industry and the goals of the firm, you won't be able to appropriately leverage your technical abilities to make a difference in the long run. And let's face it: making a difference is what data science is all about. Again, this isn't difficult to understand. Data science persons need real communicate good blah blah. Burtch summed up the reasons for this in her previous iteration of the post: The "data scientist must enable the business to make decisions by arming them with quantified insights, in addition to understanding the needs of their non-technical colleagues in order to wrangle the data appropriately." Boom. This is related to skill #1, education and training. 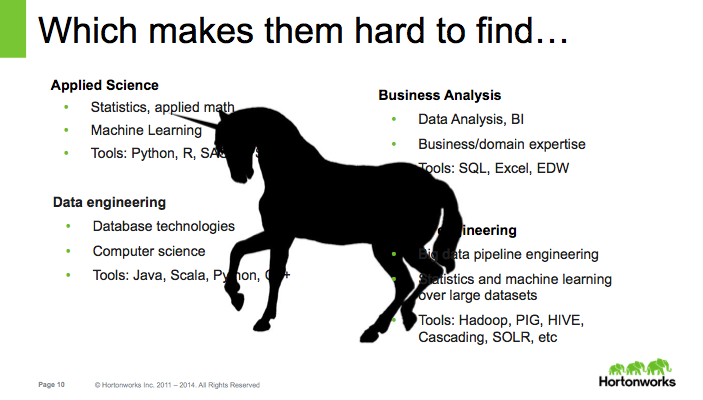 Let's again think of the unicorn; he or she could, in all their glory, fulfill any analytical or executive position at any company within their domain knowledge range. The true unicorn (henceforth, the Trunicorn) would also be guaranteed immense sums of money. But chances are you aren't a unicorn, and never will be (are there any unicorns??? ), and so you need to plan out your career path and execute on that plan. If you want to maintain a more technical role permanently, plan to keep those technical skills in tip-top shape. If you want to crossover into a role that involves more interaction with clients, then brush up on your communication and presentation skills. If you think your niche is devising and administering big data processing solutions, then get your Apache on, dammit! Good things don't come to those who wait; good things come to those who devise detailed plans of action rooted in reality, and then execute on said plans.